“This Fellowship was the most invaluable experience I could have ever asked for. I found my passion for oncology nursing and my confidence as a nurse grew immensely." "My experience working with adult leukemia patients at Johns Hopkins opened my eyes to the amazing skill and compassion exhibited everyday by the staff. I was able to grow as an aspiring Oncology Nurse as I cared for a variety of patients and seized each opportunity to practice my skills or observe procedures. My love of Oncology Nursing intensified during the Fellowship." "This Fellowship program allowed me to pursue my passion for Pediatric Oncology nursing. The resources and experiences provided allowed me to feel more prepared to work in this specialty area." "This program made an impression on me that I will carry for a lifetime. The patients, families, and staff I met taught me more about nursing than I ever could have hoped for. Oncology is a very special field of medicine full of uniquely strong and determined people, and this Fellowship has encouraged me to be a part of that group some day." "By working side-by-side with motivated, bright and dedicated preceptors, I further developed my nursing and critical thinking skills. The CHOP team included me in unique procedures, new diagnosis teaching, and family discussions, widening my perspective on pediatric oncology. Most importantly, I had the privilege of developing special relationships with my patients and their families, a main reason why I chose to become a nurse. This program confirmed my passion for Pediatric Oncology and I am grateful for this amazing opportunity." "I have always had an idea that I wanted to go into Pediatric Oncology nursing, but this Fellowship experience confirmed this calling and exceeded my expectations. The program made me love Pediatric Oncology even more and gave me the opportunity to grow as an aspiring nurse. I loved learning about various aspects of Oncology Nursing like Radiation Oncology, Bone Marrow Transplant, and Palliative Care. This program equipped me with the skills necessary to continue my professional career in Pediatric Oncology Nursing." "Through this program, I was able to develop the skills and confidence needed to excel in the art and science of pediatric oncology nursing. I cannot thank the CHOP staff enough for the unique opportunity to immerse myself in work that was as challenging as it was rewarding. I am excited to carry the lessons I learned about high quality patient care and compassion throughout my future career." “This 10-week oncology nursing Fellowship not only taught me about the technical requirements of an oncology nurse, but the emotional aspects as well. Working directly with a nurse preceptor allowed me to gain confidence in my nursing skills as I cared for pediatric cancer patients and their families. I am fortunate to have had this opportunity that will help me provide holistic care to oncology patients in the future." Kimberly Demirhan, George Washington U. "The Flynn Fellowship not only developed my nursing skill set and knowledge, but helped me develop a real passion for oncology nursing. This is a one of a kind opportunity for nursing students and I feel very blessed to have been part of the Flynn Fellowship at DFCI"
"My experience this summer at Dana Farber was truly transformational. The most remarkable aspect about the Flynn Fellowship is the intentional rotations shadowing experienced nurses in different specialties within oncology. This provided me with a full picture of all the stages oncology patients encounter from diagnosis, to infusion treatments, to palliative care. This Fellowship demonstrated the endless opportunities within the nursing profession. My passion and knowledge about oncology has grown tremendously as a result of this 8- week internship. As a Flynn Fellowship alumnus, I'm entering my senior year with more confidence, motivation, and passion that will undoubtedly shape my role as a nurse in the years to come." 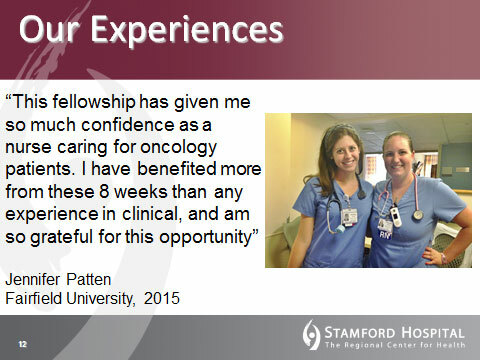 "This Fellowship has cemented my desire to be an oncology nurse when I graduate in May. I have gained a newfound confidence when working one-on-one with cancer patients, and it greatly improved my nursing skills. Through this program I was able to experience aspects of nursing that I would have never been exposed to in our regular nursing curriculum." "My experience as a Flynn Fellow at Greenwich Hospital was incredible. While gaining invaluable clinical skills and knowledge of the role of an oncology nurse, I was also able to foster close relationships with the nurses and doctors who make up the Oncology and Palliative Care departments, as well as several patients and their families. I had always had a desire to become an oncology nurse, and the Fellowship has without a doubt reinforced that." "The 8 weeks that I spent on the oncology floor with the nurses and visiting other units opened my eyes to every aspect of oncology nursing. I was able to gain insight, knowledge, and friendships that will forever be with me through this program. This Fellowship experience reinforced my love for oncology nursing and confirmed that this is the field I plan to pursue." "This Fellowship has given me the greatest preparation to become an oncology nurse and I truly feel as though my New Nurse Orientation will be less stressful and more efficient since my exposure and opportunities though this Fellowship were so advanced and comprehensive. I am so grateful for this opportunity and cannot wait to encourage all my younger nursing friends at Penn to apply for it because there is no program comparable. Penn Medicine has it all, and I am so thankful I was able to be a part of such an amazing team this summer." "I cannot express my gratitude enough for the wonderful, intelligent oncology nurses and staff at HUP. This Fellowship not only stimulated my passion for oncology nursing, but taught me valuable skills for my future career." "As a Flynn Fellow I learned invaluable skills that went far beyond the scope of the oncology curriculum taught in the classroom and uniquely helped prepare me for my career as an oncology nurse. I was exposed to many interdisciplinary functions that play a key role in patient and family/caregiver-centered care and to evidence-based practice and nursing research, which are essential to nurse’s involvement in and approach to treating cancer. I made connections with many people that will not only last for years to come, but help open doors and provide ongoing guidance and mentorship to make me a better oncology nurse. I will forever be a part of a family of caregivers who strive for excellence in the treatment of patients with cancer." “This Fellowship magnified my passion for nursing and oncology, replacing fear and uncertainty with a sense of security and purpose. The families and patients I’ve met and their incredible stories of strength, perseverance and acceptance have impacted me greatly and will follow me as I graduate and continue to deliver my nursing care." “This Fellowship program has taught me more about patient care than I ever imagined. Because of this program, I am much more confident in not only my skills but my bedside manner. It has also helped me develop a passion for oncology nursing. Truly a one of a kind experience." “From the moment I began nursing school, I knew that I wanted to specialize in oncology. The Susan D. Flynn Oncology Nursing Fellowship provided me with the opportunity to grow as an individual and enhance my skills as a future oncology nurse through hands-on clinical experience. At Stamford Hospital, I witnessed life-changing moments every day that reinforced my passion for this field. 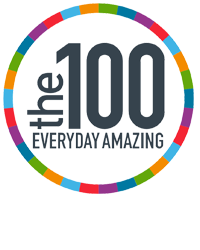 "I feel so grateful to have been granted this Fellowship opportunity. I have such a clear picture of the passion, knowledge, and care that it takes to be an oncology nurse. I learned things that are far beyond what I have learned in nursing school in just 8 weeks, since oncology is such a specialized and challenging field. I witnessed the work of some of the most amazing health care professionals this summer who emulate the work of what a nurse truly is, and I truly hope to follow in their footsteps." "I am beyond grateful for having participated in this program. I was able to strengthen my critical thinking skills, while also learning about the value of patient and family-centered care from some of Emory's best oncology nurses. I cared for such humbling patients and their families who showed me how to persevere through the most difficult struggles. I have made a special connection with the field of oncology nursing, and I am so excited to carry this powerful experience with me throughout my career." "My love for nursing grew tremendously during my 8 weeks as a Susan D. Flynn Oncology Nursing Fellow. The amount of exposure I had to the different areas of Oncology and the various roles that nurses take on in the Oncology field were more than I could have ever imagined. If it wasn't for this Fellowship I may not have ever known how much palliative care means to me and the future of healthcare. I believe the connections I have made will have a great impact on my future as a nurse." “The Susan D. Flynn Oncology Nursing Fellowship has been the best experience of my student nursing career. I have gained incredible insight to what it means to be an oncology nurse. New York Presbyterian gave me the confidence and skills to be an effective and compassionate nurse in Oncology. This one-on-one guidance is unlike any clinical experience I have encountered. I feel more confident in my care to patients and my love for Oncology is continuing to grow. I look forward to utilizing this knowledge for the rest of my nursing career. "I am so honored to be a part of such an amazing program. The nurses at Stamford Hospital taught me more about oncology nursing than I could have ever imagined. The caring and intelligent nurses and staff are my role models. I will carry my experiences throughout my entire career as a nurse. I am so grateful to have had this opportunity." "My Fellowship experience has been the most valuable experience of my nursing school career. I learned so much about cancer care through this Fellowship that I never would have gotten the chance to in nursing school. I gained confidence in my nursing skills and knowledge throughout the 8 week program. The deep, meaningful relationships I developed with patients and the influence of the outstanding nurses and staff at Wentworth-Douglass Hospital taught me so much that I couldn't have learned in a lab or a lecture. This Fellowship reminded me of the importance of nurses in patient care and emphasized why I chose this profession in the first place. I feel ready for the future both in nursing school and in an oncology nursing career beyond graduation."